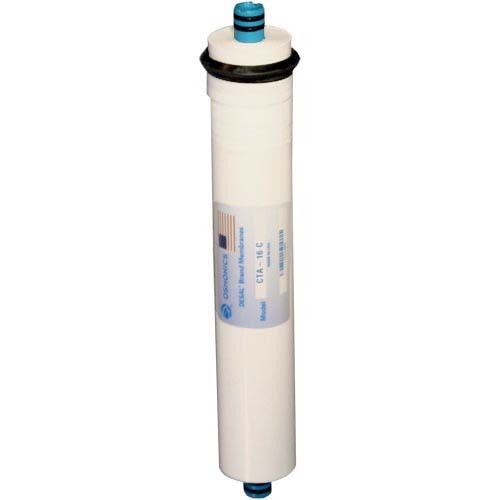 The GE Osmonics Pentair CTA-16C Reverse Osmosis Membrane is a highly efficient filter system that guarantees high-quality clean water from virtually any source including surface water, tap water, well water or seawater. Its spiral wound membrane elements purify water for use as drinking water, boiler feedwater, seawater desalienation, rinse water, and water reuse. The technology in this RO membrane reduces many pollutants and contaminants with a premium membrane process that removes particles 100,000 smaller than human hair. It has a filter life of 2-3 years(dependent on water quality and usage). The extended filter life is attributed to the chlorine resistant membrane which is made of cellulose acetate that will not wear out easily regardless of carbon pre-filters. This CTA-16C RO Membrane has a flow rate of 16 gallons per day -- the perfect output capacity for smaller households. Culligan compatible. A step up from its previous design(CTA-16), the GE Osmonics Desal CTA-16C membrane is now compatible with Culligans H5 and H53 RO systems as well as several other RO systems from different brands. 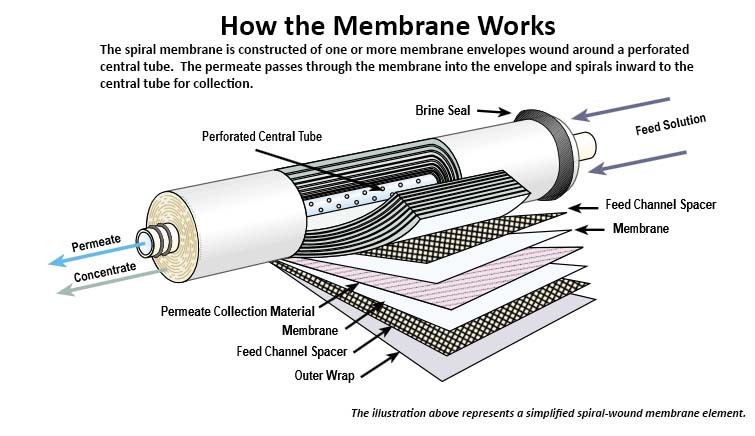 Chlorine resistant membrane made of cellulose acetate, will not easily wear out. RO technology reduces lead, mercury, chromium, nitrates and many more contaminants. Impurities captured on the membrane are constantly swept away, so the surface is continuously cleaned--reducing maintenance costs. GE CTA-16C Membrane Fits following Brands: 3 Stage RO System Ametek / Kleen Plus RO-2127 , WSRO10C HDRO-10AG Replacement Filters, Bruner DWS-1 DWS-2 V15 Filters , EcoWater ERO 200 RO System , Hague H2000 , Hague H2500 , Lancaster model with Fitting at the bottom of Membrane Housing , Marlo Standard Series Microline model with Fitting at bottom of Membrane Housing , Pure-Tel RO-10 , CTA-5 Reverse Osmosis system , Residential RO Membranes TGI-315 & 315TFC , Three Stage 15gpd RO Replacements for Water-Right model with Fitting at bottom of Membrane Housing , ROM16C , ROM-16C , ROM-16-C , ROM16-C , Fastek 8205-096 8205096 , and many more.